Fish are pretty easy to draw because they don't have legs, or wings, or show a lot of different expressions, like people do. If you did want to show surprise in a cartoon fish, you could make its eyes look extra large, have its mouth be open, and show its fins "standing on end" much like the way people are shown with their hair standing on end. Of course, people do not make their hair stand on end when they are suprised, but we all understand the straight-out hair as meaning a burst of excitement. Fish do actually spike up their fins when they are on alert, but they probably do this because their muscles are all tense and ready to get them out of a tight spot in a flash. The simplest way to draw a fish is to make an eye shape where one side of the eye shows each curve going beyond the eye to form the tail. You can see this image all over on people's cars... it was an early symbol of Christianity and used as a secret "code" among Christians during their persecution in Rome. You can fill in the simple fish of two arcs by adding a top fin (also called a dorsal fin), closing the tail, and then adding a curved line where the gill would be. Then add one small fin just under the gill line, and a strong black dot to represent the eye. Your fish is now looking a little more realistic. The fish above, the angel fish is a popular addition to many home aquariums. It shows how you can take different fish shapes and simplify them into interesting drawings. For instance, if you wanted to draw a goldfish, you could take the basic "two curves" fish and make the curves tighter to show the somewhat stocky body of a goldfish. The next time your are in a pet store, notice how some goldfishes' bodies are almost triangle shaped, because their bellies are so big. To continue your goldfish drawing you would make the tail of your simple fish much longer, the dorsal fin higher, and the eyes extra big. You could also make the mouth open, because goldfish are always opening and closing their lips. 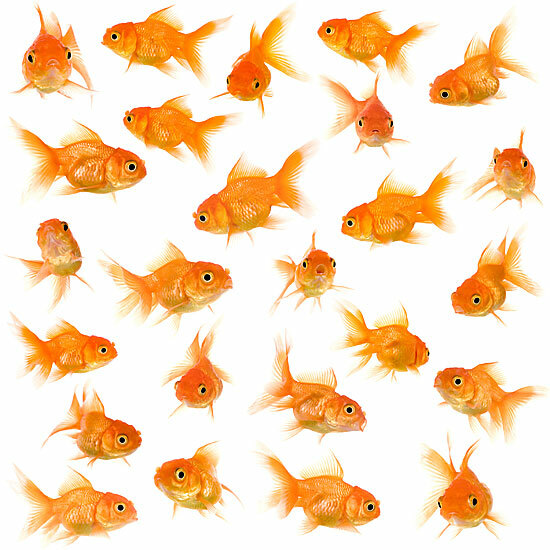 Color it orange or gold (or yellow with highlights of red if you only have a few colors to work with) and everyone will know your drawing is a goldfish. 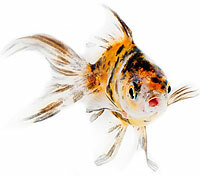 Here are some images of real goldfish to get you started.